Happy NTT, y'all! 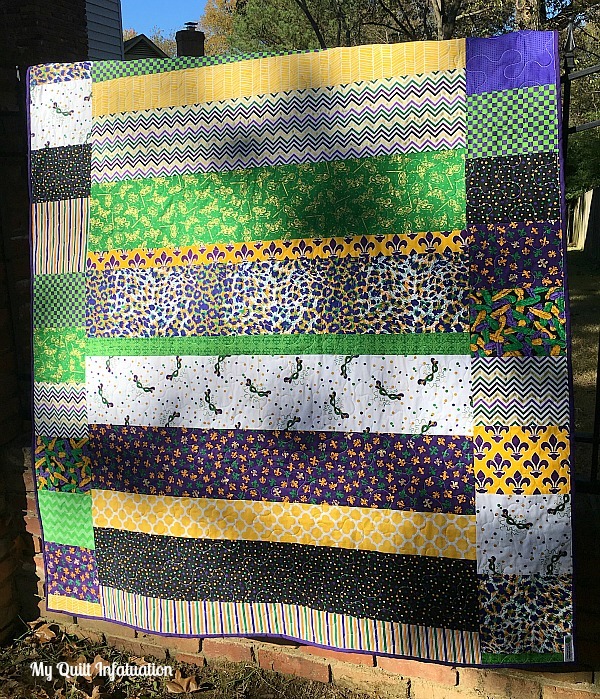 Over the weekend, I finished up my Mardi Gras quilt, and planned to get started on a baby quilt for a friend next. Well, sometimes the best laid plans get thrown out the window. The nursery is decorated in shades of slate blue and gray, and has a modern woodland theme going on. My friend actually asked specifically for fabrics with bears and/or deer in it. 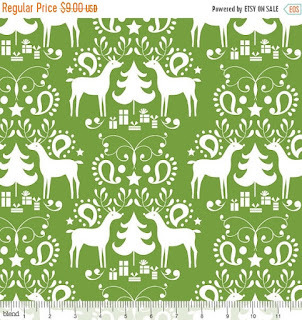 She even had these two fabrics in mind if I could find them. The first is called Bear Hike by Birch Organics, and the second is called Buck Forest, from the Hello Bear collection. I finally found them from the same shop to save on shipping (in the right colors), and they just arrived today! Waiting for a specific fabric to arrive in the mail is torture when you're trying to stay on a schedule, not to mention when you're working up to a holiday. 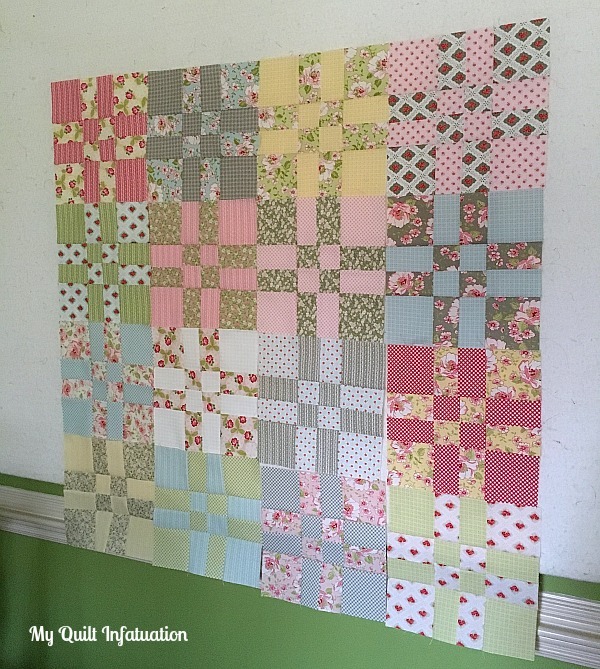 Anyway, now that I have everything I need, I love the fabric pull for this baby quilt. It's going to be so sweet. In the meantime, flexibility is the name of the game. 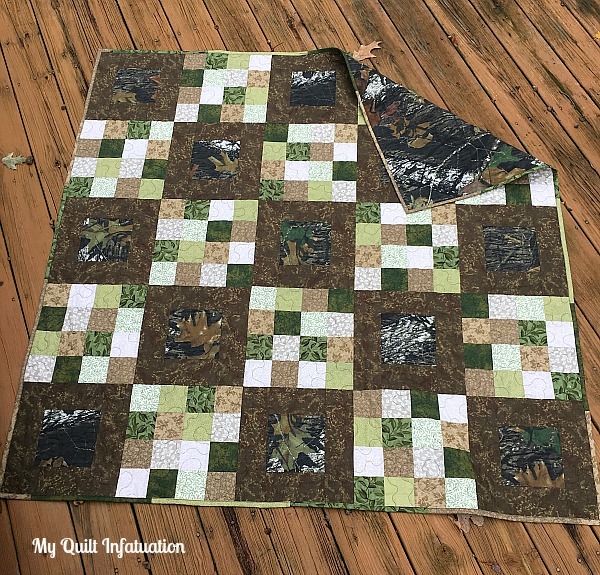 I decided to go ahead and knock out the next quilt on my to-do list, a camouflage quilt for a friend's son, who is an avid outdoorsman. 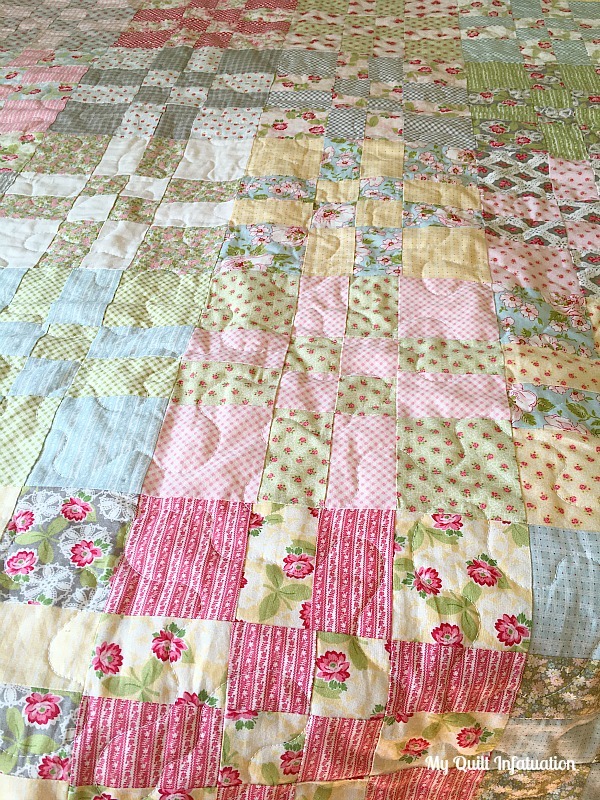 From cutting to binding, this quilt went together in just a couple of days (with a couple of late nights), and I'm delivering it to her tomorrow! 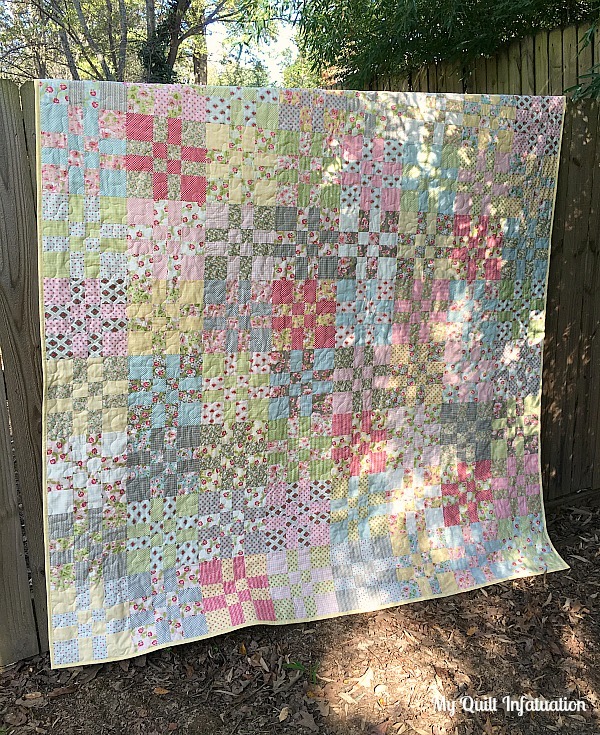 If it looks familiar, it's because she saw a photo of this quilt I made for my brother in law a couple of years ago and fell in love with it. There are just a couple of differences between the two quilts. First, I found a fabric that has a marble print in shades of brown, and decided to use that for the square frames, rather than solid Kona Chocolate. I also chose to make a scrappy binding on this one. 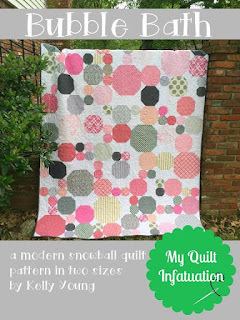 I think both of these choices add some depth and texture to the quilt. The backing is solid Mossy Oak camouflage, and I quilted it with chocolate brown thread. 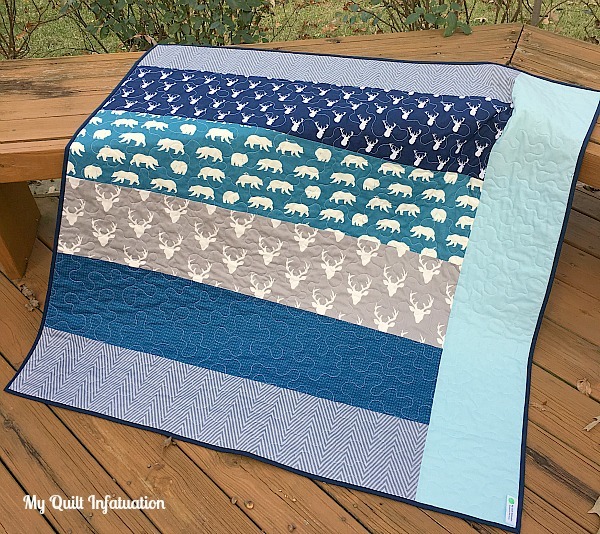 This finished quilt measures 60" x 60," and I think it will be just perfect for taking along on a camping or hunting trip! Without further ado, check out a few highlights from last week's party that really caught my eye (it was especially tough to pick this week). 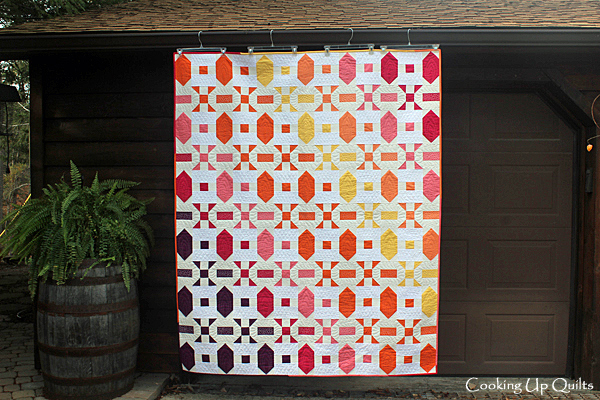 Judy from Sew Some Sunshine linked up this ultra-modern hexagon quilt. So unique! 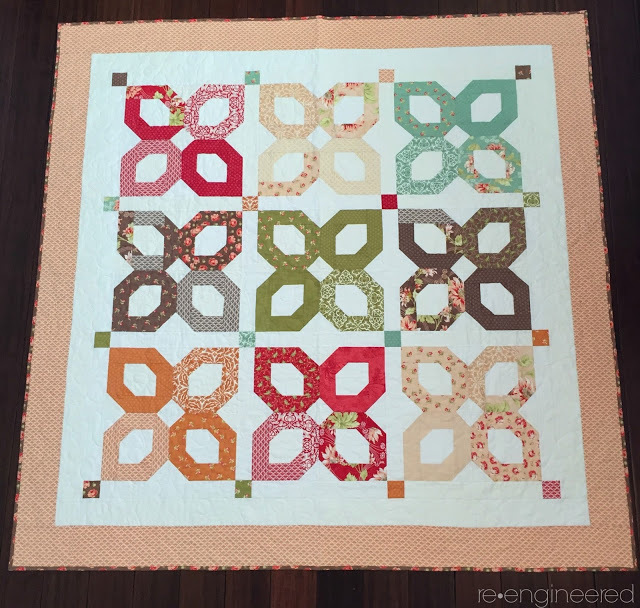 Valerie from re-engineered shared her Clovers and Jam quilt, and I love the earthy colors in this one! and finally, Greta from Material Detachment showed off her finished Pickle Dish quilt. 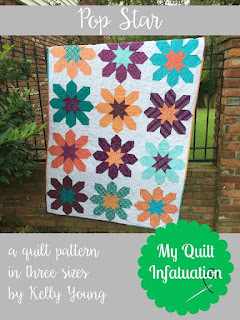 I absolutely adore this pattern, and the orange and green combo is so much fun! Okie dokie, friends! It's time to link up your latest masterpieces, or masterpieces-in-progress! 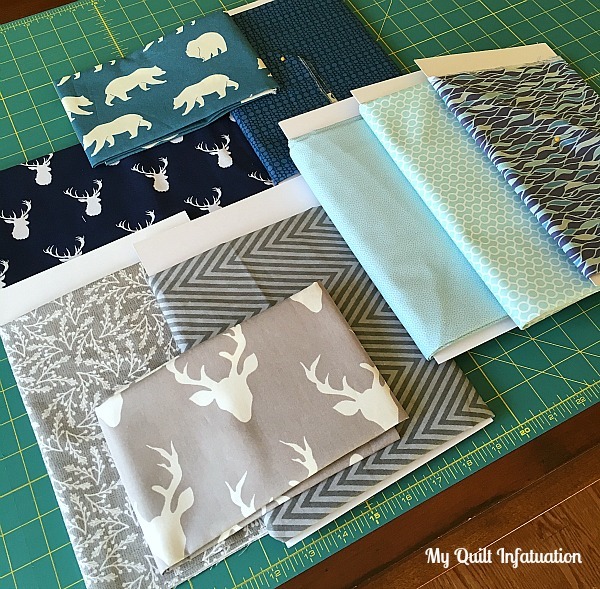 I can't wait to see what you're sewing these days! Oh, and one more thing- NTT will be taking a break next week for Thanksgiving, but will return on December 2nd. I hope all of you in the US have a wonderful holiday filled with family, food, and fun! Mardi Gras Revelry is finished, and I am so happy to report that it is packaged and ready to ship out today! There are feathers, masks, and fleur de lis prints, as well as more traditional prints in Mardi Gras colors, like the chevron, stripe, checkerboard, and polkadot fabrics. A few of the prints have some gold metallic accents (but not too many). 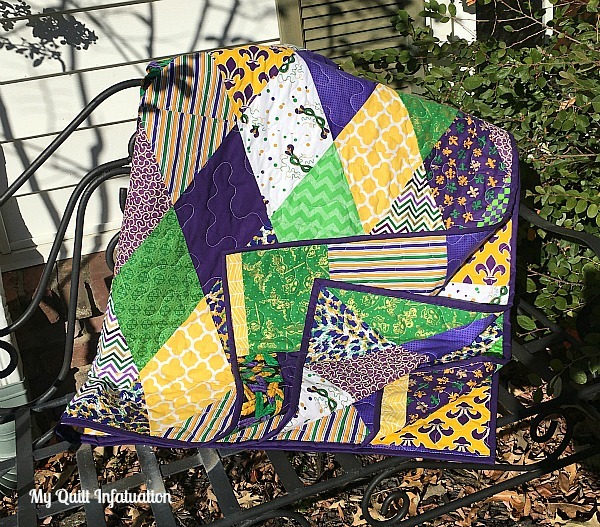 Then there's my most favorite fabric- the Mardi Gras leopard print! 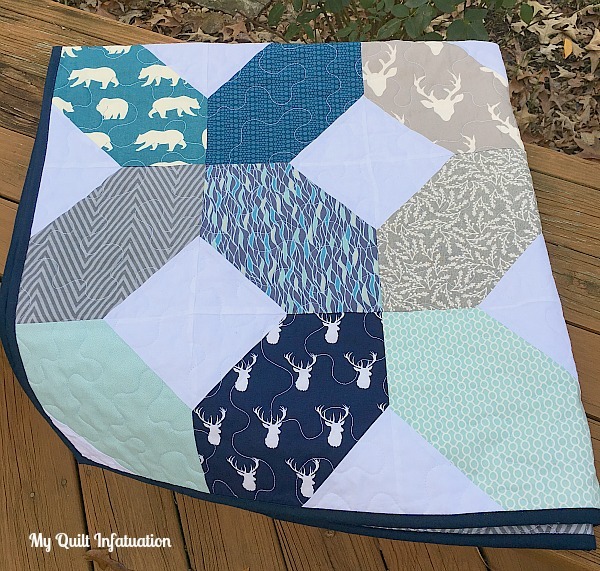 When I bought the fabrics for this quilt, I almost left this one out because I felt like it was almost too over the top, but I am SO glad I decided to include it. 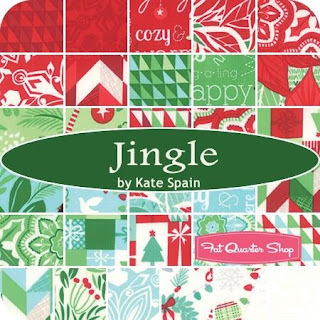 I love that it is a themed fabric, but so unpredictable. I made use of every single bit of the fabrics in the pieced backing, and finished it off with a Kona Purple binding to frame all of that loud print. 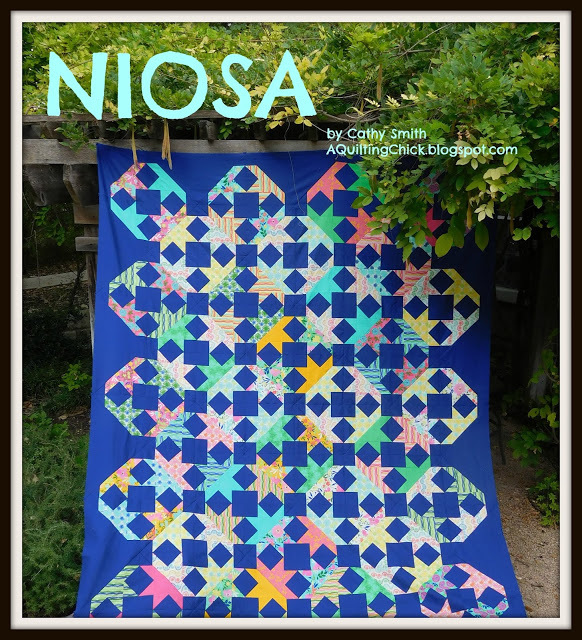 The finished quilt measures 56" x 72," so it is a really great throw size. 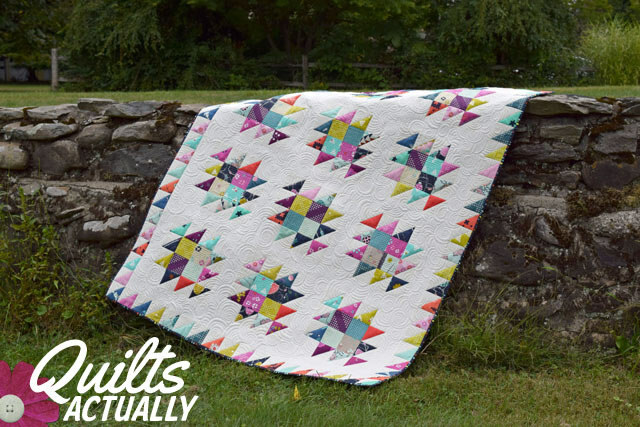 I think the combination of the fun fabrics, along with the diamond pattern reminiscent of harlequin masks came together pretty perfectly on this quilt. And I think it truly captures the spirit of Mardi Gras! 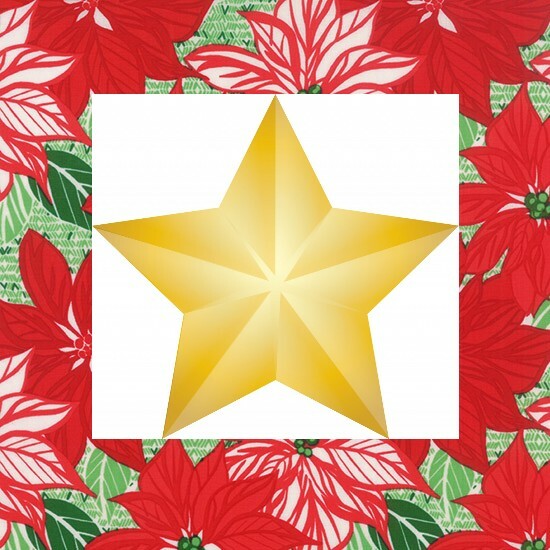 It's glitzy, loud, ostentatious, and so much fun- perfect for the season where those of us from Louisiana "laissez les bons temps rouler," or let the good times roll! Not what you were expecting? We all get so preoccupied with Thanksgiving and Christmas, but if I asked you what holiday comes after Christmas, I know many would probably say Valentine's Day. That is, unless you live (or are from) Louisiana. For us, Mardi Gras is next! Mardi Gras day falls on the Tuesday right before Lent, but we actually let the good times roll for an entire season, beginning on January 6th. This day is also known as Twelfth Night, Three Kings Day, or Epiphany. Many Louisiana folks decorate their homes for Mardi Gras, and some even take the decorations off of the Christmas tree and replace them with ones of green, purple, and gold (not me, by the way). 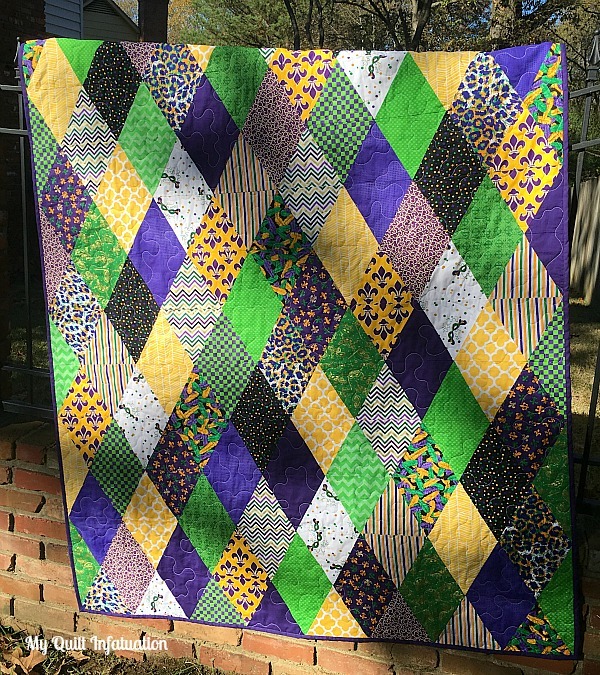 This quilt is for a friend in Louisiana who wants a Mardi Gras quilt, and was very clear about the fact that he had no qualms about it being loud and busy. 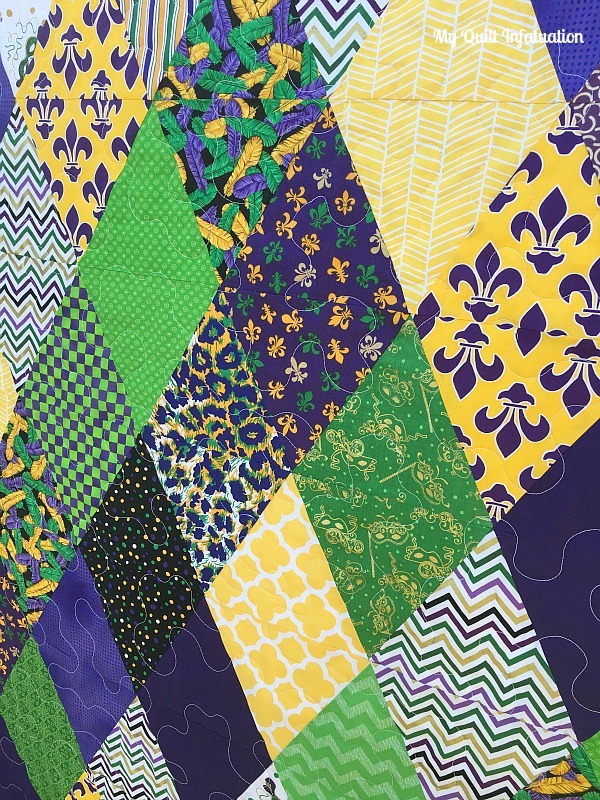 After all, Mardi Gras is a glitzy holiday, so why should a quilt to celebrate it be any different? I chose to make a diamond pattern because it reminds me of harlequin masks, which are often used in the decor of the season. I just need to get this top squared up, and get going on the backing! 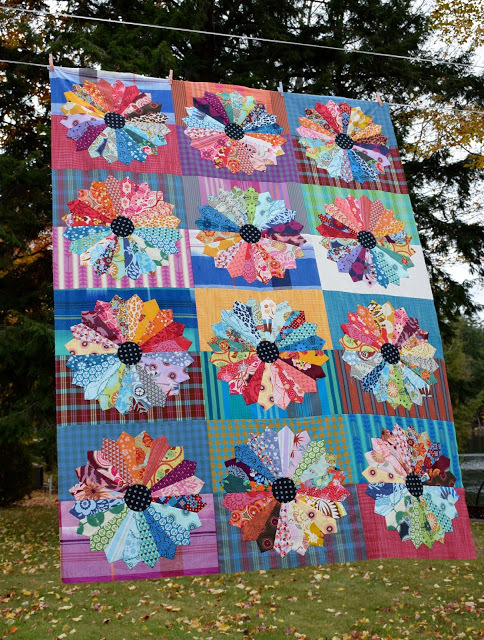 Beth from Cooking Up Quilts showed off this quilt, called Snap, Crackle, Pop! Isn't it awesome? 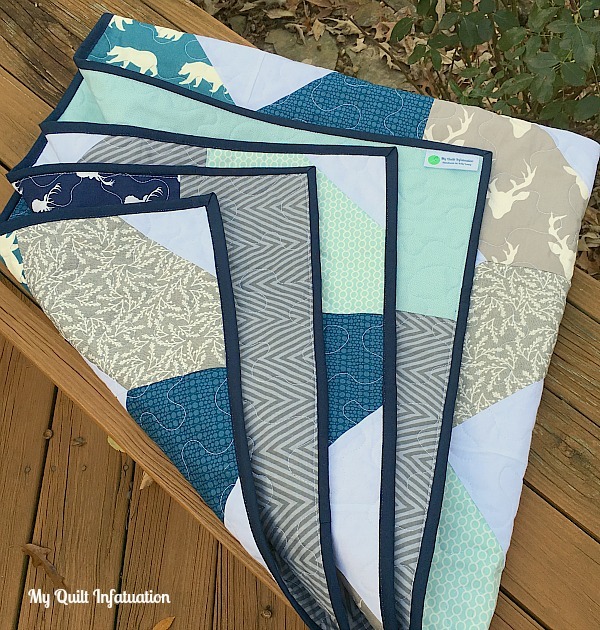 and Heather from QA Creations linked up her newest quilt, Forging Steel. Gorgeous! 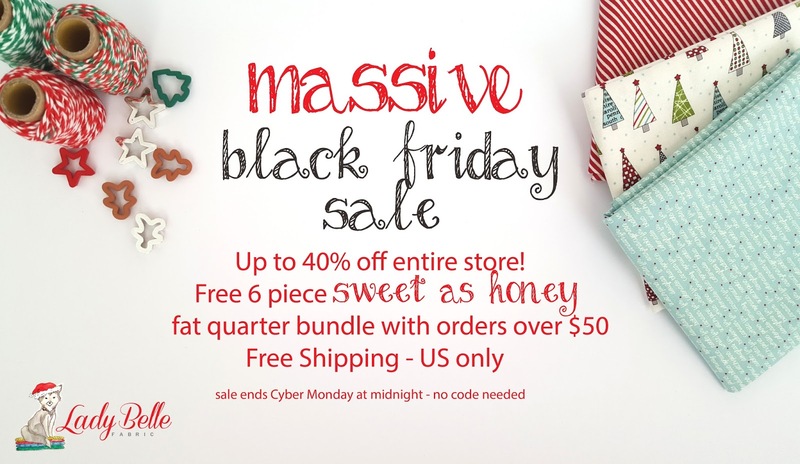 So, maybe you're working on holiday projects of a different kind; or maybe some holiday gift sewing; or maybe just something fun for yourself? I can't wait to see! 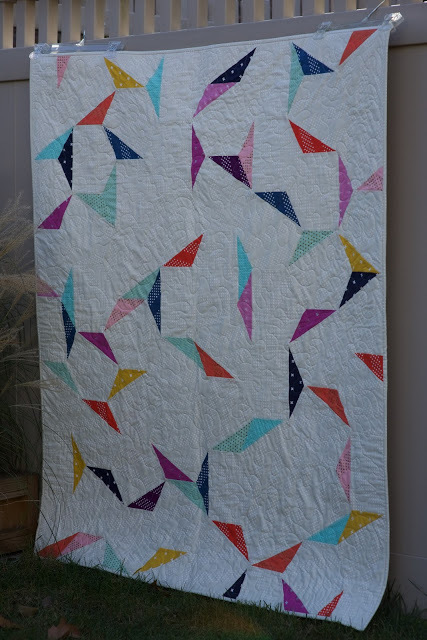 I finished this my Ambleside D4P quilt this morning, and though the lower volume hues are outside of my norm, I really fell in love with the delicate prints and soft colors. 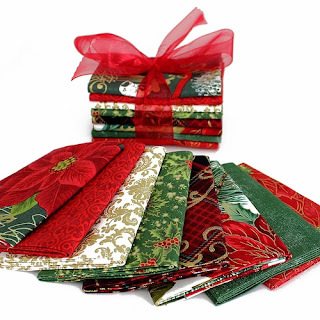 Every fabric in this sweet collection makes me think of vintage linens and lace, or embroidered handkerchiefs. Although the florals are updated, they look like they could be right at home on a bed during a bygone era as well. Because of the timeless florals and simple pattern, I decided to name this quilt Nostalgia. 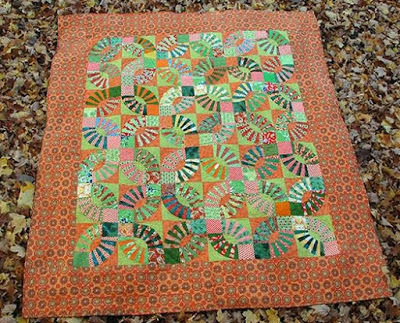 If you missed my last post, this quilt will be a Christmas gift for the parents of a family member (by marriage). Since the recipient's favorite color is yellow, I was asked to make the binding and backing yellow. 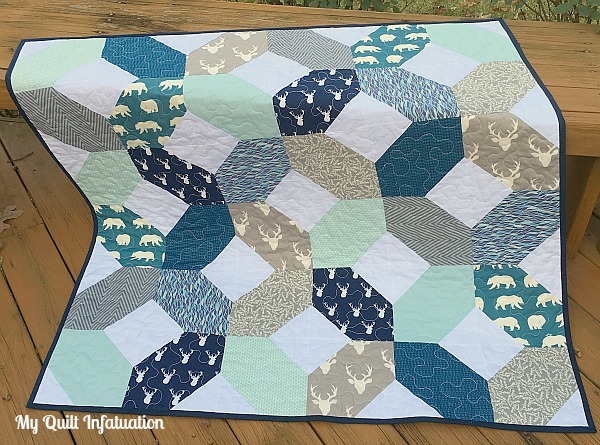 I really prefer for my binding and backing to be in contrasting colors so that when the quilt is turned over, both are distinct, so right away, I knew I needed to figure something out to be happy with it. 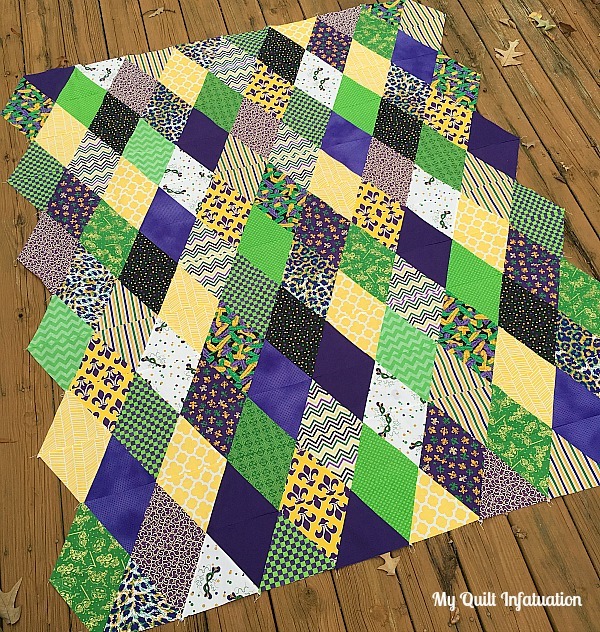 My solution was to use wide yellow stripes on either side of the scraps, then smaller green stripes down the length of the quilt. 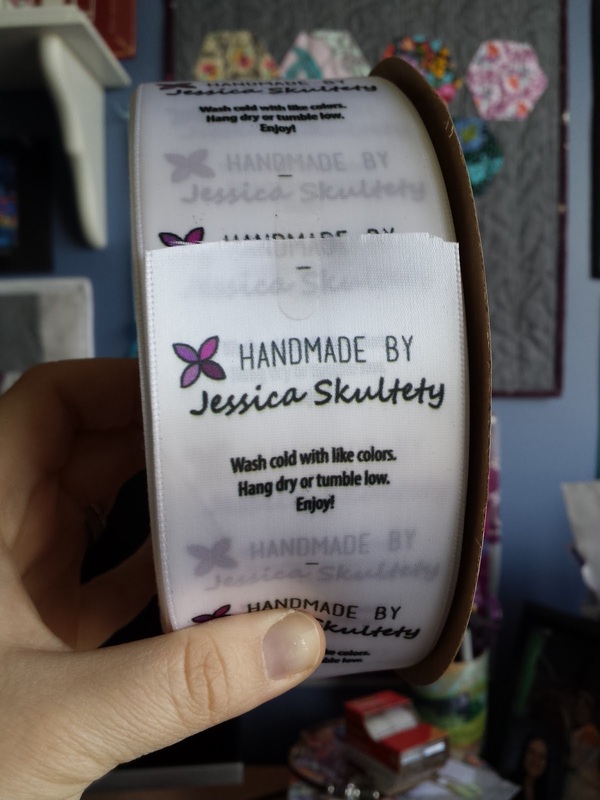 By doing this, I was able to minimize the binding and backing blending together. I used the same yellow fabric for both backing and binding, so it doesn't look strange on those small places at the top and bottom of the quilt where they do meet. I think the backing and binding are a win-win- lots of yellow, but still plenty of contrast. 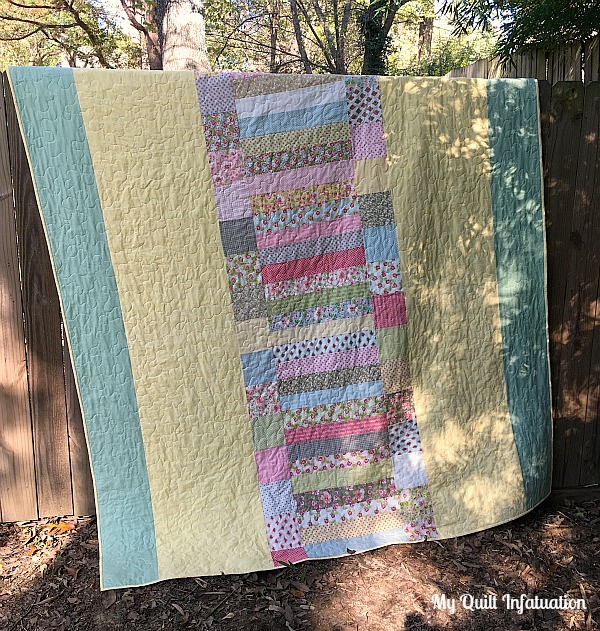 This finished quilt measures 80" x 100," so it will cover a queen sized bed generously, and the quilt, including the scraps on the back, used up every single bit of a 40 FQ bundle- hooray for zero leftovers! These soft, dainty prints were so nice to work with, I just might have to choose lower volume fabrics more often!